With craveable flavors pulled in from across the country, Block 16 Urban Food Hall at The Cosmopolitan of Las Vegas was destined to be a hit when it opened. But Block 16 is much more than the sum of its parts. 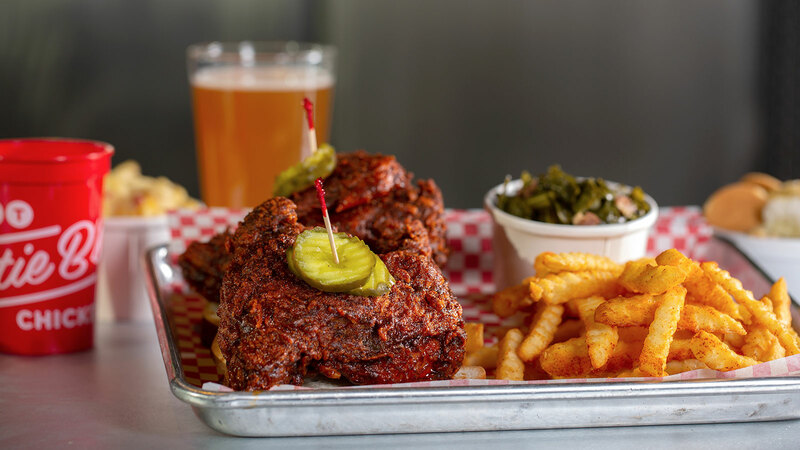 So we thought we’d get to know a little more about the individual food purveyors found inside this culinary complex, starting with Hattie B’s Hot Chicken. This Nashville-based, family-run business has quickly become one of its home city’s must-visit foodie destinations. We visited with father-son co-founders Nick Bishop Sr. and Nick Bishop Jr. to talk about the origins of Hattie B’s, what makes great hot chicken, and why they decided to bring this Nashville favorite to The Cosmopolitan. For those unfamiliar with Hattie B’s Hot Chicken, how would you describe it? Nick Jr.: Hattie B’s is unlike anything you’ve ever had. We take great Southern fried chicken and just flip it on its head. After a long night out at the tables, or dancing, or seeing a show, it’s a good way to end your night on a high note. Obviously, you’re a family-run business, but how important is family overall to the Hattie B’s story? Nick Sr.: As a company, as an organization, we’re all about family. Our family consists of our fry cooks in the back of the house, and our general managers. Our family circle is why we’re here. It’s why we’re successful. And I come from a restaurant family. My father actually had a long career with a restaurant company. My father is a great teacher and a great leader, and has been a great influence to both Nick [Jr.] and I through the years. It also gave me an opportunity to take extra time off during the week. I played a little golf. Got out on my boat a little bit and tried to enjoy a little retirement, but that didn’t work for me. So, we started thinking about an iconic food item here in Nashville, hot chicken, which we had all grown up as family eating. We started working on that together down at Bishop’s. We put together our spice blend and what we felt like was truly authentic for us. Started testing it on many of our customers that came in the store. It got a lot of great reviews. A lot of people enjoyed it. It quickly became about 30 percent of our menu sales. Some people said, “You know, it’s a little hotter than I expected,” so we worked towards different levels of heat. We have Southern fried chicken, which is just great fried chicken. And then the other five levels of heat: Mild, Medium, Hot!, Damn Hot!, and our hottest is Shut the Cluck Up. You know, that’s a lot of fun for people as well. That’s kind of the origin and how we started Hattie B’s. The name “Hattie B’s” comes from family, too, right? Nick Sr.: Yeah, Hattie B’s is my grandmother and my mother and my seven-year-old granddaughter. They’re all Hatties. Nick Jr.: For me, I think the family aspect was there in the beginning. It was how it all started. I think there’s a level of trust that you have with family. And so, being able to come into that experience and that trust, and that bond, and being able to apply it to how we treat our guests and our staff. And even watching a lot of our families kind of combine. Staff gets married, and graduates college. You get to share in parts of their own lives and their own families. I think that makes it really a special thing for us. Nick Sr.: Something I think that Nick Junior and I strive to do is surround ourselves with great people, people we can have fun with, and that have energy, and that can share that with people that visit with us. But my dad, at 88, he’ll come and visit, he and my mother. He’s got to have Hattie B’s while he’s in town. I generally give him a legal pad and a pen. He will disappear for about an hour, come back with a page and a half of notes on things that we haven’t done really well and things that we need to improve. And things that he feels we need to get better at. What is so special about Hattie B’s chicken that you just can’t find elsewhere? Nick Jr.: You know, I think it starts with a great Southern fried piece of chicken, which is something we really knew we had before the hot chicken piece of it came along. Again, out at Bishop’s we served great Southern fried chicken. That was where it all started. But growing up around hot chicken and knowing that it was very much a uniquely Nashville thing, but had not made its way outside of the city—kind of paralleling that with the way Nashville was growing. We saw a chance to add our spin on it. And then you realize as you go around to the hot chicken places that everybody does it a little differently. Once we realized that, that gave us sort of the freedom to do it our way while still paying homage to the original form of the dish. Nick Sr.: I think the main ingredient of our hot chicken is love. We put a lot of love into what we do. And really, trying to create an experience that people will come back and enjoy. Having that opportunity to bring them back and be a part of that in all of our locations is very special. Nick Jr.: We take a lot of pride in being a place where you’ll find people from all over the city, all walks of life, all ages, all races, all religions. It’s probably my favorite part of Hattie B’s, to look around the dining room and just see this sea of diversity. People that are there for fried chicken. It’s a pretty neat thing that can kind of unite and unify people. What goes into making that experience? How do you ensure guests have that special feeling? Nick Jr.: Some of the details that I think are important to Hattie B’s and how we run our restaurants start with hospitality. We can fix food that we mess up. We can’t fix service. A lot of people come and experience hot chicken for their first time with Hattie B’s. And it may be their first stop when they visit Nashville, or their last stop. Knowing that, it forces us to step our game up and really bring it every day. For us, that was just sort of one of the keys to our early success: being thankful and grateful for the people that were willing to wait in a line or walk through the doors, or try to squeeze in at a table with somebody, some stranger that they don’t know. That’s part of the experience of being here. There’s such a great variation from day to day here. Whether it’s the type of people that come in, or music that’s playing—you could have Mötley Crüe one day or De La Soul the next day—or something that’s going on in town. It keeps things fresh and we try to be as authentic and real from day to day. And just sort of figure out problems as they come, and make sure that everyone that walks through our doors understands how thankful we are that they chose us. What made The Cosmopolitan a good fit for Hattie B’s first West Coast location? Nick Jr.: The Cosmopolitan, first and foremost, has a world-class culinary program. From the restaurants to the bars, we fell in love immediately with a lot of the other chefs and restaurants that were already there, and knew that we would fit in with that group well. And then after meeting the team, we hit it off immediately and knew pretty quickly that it was a place that we wanted to be. To be a part of that was an honor and something that we’re really excited about.